The purpose of Advances in Soil Science is to provide a forum for leading scientists to analyze and summarize the available scientific information on a subject, assessing its importance and identifying additional research needs. A wide array of subjects has been addressed by authors from many countries in the initial ten volumes of the series. The quick acceptance of the series by both authors and readers has been very gratifying and confirms our perception that a need did exist for a medium to fill the gap between the scientific journals and the comprehensive reference books. 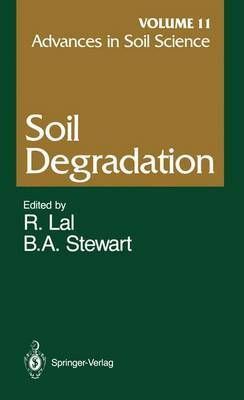 This volume is the first of the series devoted entirely to a single topic- soil degradation. Future volumes will include both single-topic volumes as well as volumes containing reviews of different topics of soil science, as in the case of the first ten volumes. There are increasing concern and attention about managing natural re- sources, particularly soil and water. Soil degradation is clearly one of the most pressing problems facing mankind. Although the spotlight regarding soil degradation in recent years has focused on Africa, concern about the degradation of soil and water resources is worldwide. The widespread con- cern about global environmental change is also being linked to severe problems of soil degradation. Therefore, we are indeed pleased that the first volume of the series devoted to a single topic addresses such an impor- tant issue. The current volume is also the first of the series involving a guest editor.